Serves 4 The Koreans have a tradition of stirring together all the food offerings made at an ancestral rite and then eating the mixture. 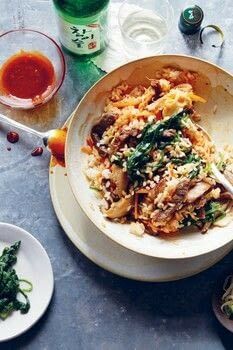 This is likely the basis of bibimbap (or “mixed rice”), where an artful composition of meats and vegetables on steamed rice is blended with a gochujang sauce. This kaleidoscope of ingredients is also rich in symbolism: black seaweed and shiitake mushrooms represent the north and the kidneys; reddish ingredients including carrots stand for the south and the heart; green cucumbers and spinach call out to the east and the liver; and white rice and bean sprouts evoke the west and the lungs. Lastly, the yellow egg yolks represent the center and the stomach. MAKE THE SAUCE: Mix the gochujang, sesame oil, brown sugar, vinegar, garlic, and 1 tablespoon of water together in a small bowl. Set aside. MARINATE THE MEAT: In a medium bowl, mix together the garlic, soy sauce, sesame oil, and brown sugar. Add the beef strips and let the beef marinate for 10 to 15 minutes. PREPARE THE RICE: Heat the vegetable oil in a cast-iron skillet over medium heat, swirling to coat the bottom of the skillet. Add the rice and pat it into an even layer. Reduce the heat to medium-low and let the rice cook, without stirring, for 10 to 15 minutes, until it has a crispy golden crust on the bottom. PREPARE THE TOPPINGS: While the rice is cooking, heat 1 tablespoon of the vegetable oil in a wok or skillet over medium heat, and add the spinach. Sprinkle it lightly with sea salt and cook, stirring frequently, for 3 to 4 minutes, until softened and tender. Transfer the spinach to a bowl and set aside. Add ½ tablespoon of the vegetable oil to the same pan, and cook the shiitake mushrooms over medium heat for 2 to 3 minutes, until they have softened and the edges are lightly browned. Add the soy sauce and cook until any visible liquid has evaporated and the mushrooms are lightly glazed. Set them aside in a small bowl. Add another ½ tablespoon vegetable oil to the pan, add the bean sprouts, and sprinkle them lightly with sea salt. Cook for 1 minute, to just heat through and soften slightly. Set aside. Heat a little more vegetable oil in the same pan, and fry the 4 eggs, sunny side up or over easy as desired. Divide the rice among 4 large bowls and set the fried eggs on top of the rice. Remove the beef from the marinade. Working quickly, add a bit more oil to the pan and cook the beef over high heat, tossing it until it is cooked through and lightly browned, 3 to 4 minutes. Divide the beef among the serving bowls, placing it next to the egg, and then arrange the spinach, cucumber, mushrooms, seaweed, sprouts, and shredded carrots, in separate heaps, around the beef and egg. Serve with the gochujang sauce on the side, so diners can stir the ingredients together with as much sauce as desired.